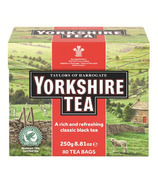 Their recipe may be a secret, but what they can reveal that to make a quality brew, you have to buy top quality tea. 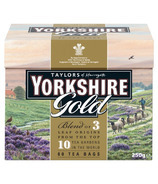 Take Yorkshire Gold, Taylors of Harrogate's 'best ever' brew. It's a bright, luxurious cup with a smooth malty flavour that comes from a blend of teas from the top ten tea gardens in the world, particularly those in Assam, Kenya and Rwanda. Then there's Yorkshire Tea Decaffeinated: because decaffeination strips a lot of flavour from tea, by putting better quality tea in at the start, it stands up to the process. So you get a brew that tastes as good as normal tea - one that's won two Great Taste Awards, in fact. Every time you sip a cup of Yorkshire Tea, you might find it surprising to know that it's actually been tasted eight times before you. To ensure you get a proper brew every time, each pack is 'eight times tasted' from the harvest to the auction room, pre-shipment and landed samples to pre and post production.